Strawberries at Raven's Berry Farm in Freedom in 2017. This year's harvest is quickly approaching, expected to peak around Fourth of July. But that kind of unpredictability can be hard for farmers and gardeners, who depend on reliable sunshine to germinate and grow seeds into plants and reliable rain to water them. Still, this spring, several farm experts weigh the knowns and try to imagine the unknowns as they try their best to give an outlook on Maine crops including strawberries, apples and blueberries. And so far, things seem to be doing OK.
Of course, a good spring doesn’t always lead to a good harvest, she said. Weather fluctuations can do a number on a farm’s outcome, and those factors are out of a farmer’s control. “It’s a lot of worry until the crop gets in, and even then you have to worry about how to sell it,” Moran said. Still, she is optimistic, a feeling shared by David Yarborough, a wild blueberry specialist and professor of horticulture at the University of Maine, and David Handley, a vegetable and small fruit specialist with University of Maine Cooperative Extension. But the news isn’t all rosy for blueberries, he added. Growers are renting fewer out-of-state beehives to pollinate the crop because of the low prices that blueberries have brought in recent years. This likely will result in limited pollination, Yarborough said, but on the bright side, blossoms seem to have minimal frost injury. Handley, too, is seeing bright sides for the state’s much-awaited strawberry crop, one of the first fruit harvests of the season. He said that the harvest looks like it’s on track to start in the middle of June at farms in southern and central Maine, which is right on time. “If all goes well, we’ll do our usual thing of peaking around the Fourth of July, maybe a little bit earlier for strawberry festivals,” Handley said. 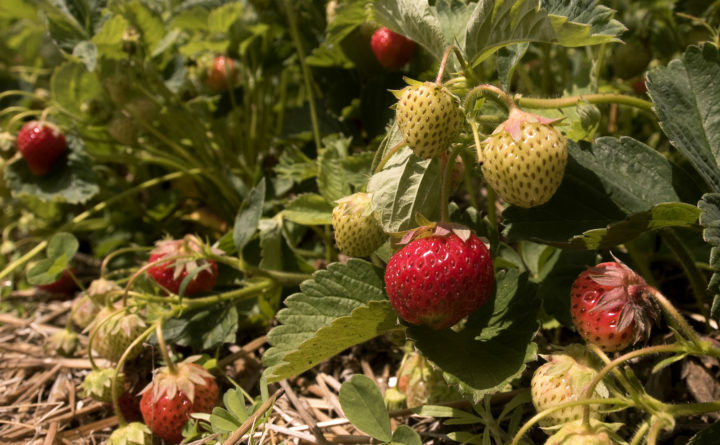 Last weekend, nighttime temperatures dipped past freezing in some parts of Maine, which can be devastating for strawberry blossoms, but growers were ready and protected their plants by irrigating them at night. As the water hits the leaves and flowers turns to ice, it releases energy, keeping those leaves and flowers at 32 degrees — a safe temperature for the blossoms. And with little rain in the forecast, growers likely will have to keep on irrigating their strawberry plants. Currently, no part of Maine is abnormally dry or in a drought condition, according to the most recent map from the United States Drought Monitor. But strawberries want about an inch of water a week, which is not likely to fall from the skies in the near future, he said. “If Mother Nature isn’t providing it, you need to help,” he said.